Times are tough and one needs to be strong in order to hurdle life’s challenges. Some people, however, can’t find the strength to deal with their personal issues the reason why they need a strong moral support from family, friends and counselors. Fortunately, there’s a wealth of information available online that provide inspiration and motivation in addition to the counseling and psychotherapy services offered on the internet. The KlearMinds counselling blog is one site that people needing motivation can turn to. It offers valuable information including tips and advice on a variety of topics very relevant in today’s society. Some of the topics covered here are on bullying, beating stress at work, overcoming personal failure and finding happiness. 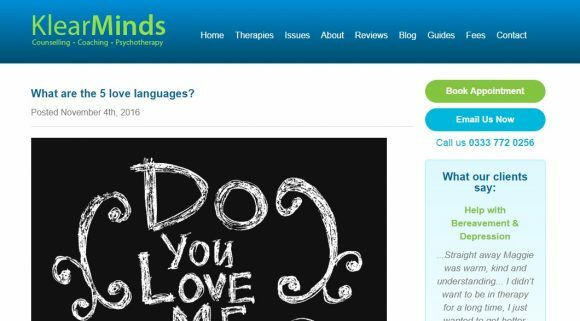 Behind this blog is KlearMinds, a company that provides different types of therapies through its trained psychotherapists and life coaches.